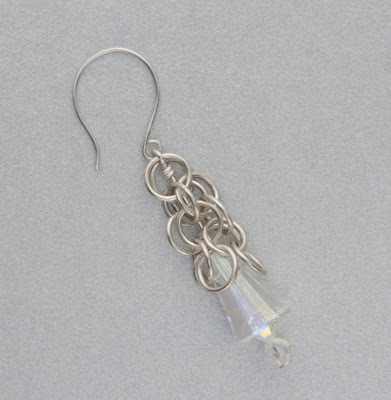 Tired of using conical beads for earring designs? Check out this easy chain maille tutorial by Kylie Jones. The round maille portion acts rather like a bead cap only a lot more open! I like her tip of using a chopstick as a mandrel to help one position the rings during the opening and closing process. You should use exactly the size rings suggested in the tutorial. In chain mail, not any old jump rings will do!